It is important to have the correct wedges to fit both your swing and the other clubs in your bag. With 14 clubs allowed in your bag, many people opt to drop a second wood/ high iron and have three (not including PW) dedicated wedges in their bag. It is important to have the right gaps between your clubs. I suggest you look at your pitching wedge loft and go from there. You want to keep your gap between your clubs consistent and not exceed more than 6 degrees. An example would be… if your PW is 45*, a popular choice would be GW at 50*, SW at 56* and LB at 60*. Alternatively if could go Sand Wedge at 54* and Lob Wedge at 58*. An important aspect of the wedge is the bounce. All top manufacturers offer their wedges in a bunch of different options. For example Titleist Vokey’s offer their SM4 wedges in 23 different loft and bounces for each club finish. Bounce can be a confusing term. It is not necessarily the amount the ball will bounce, but the angle at which the club head will slide along the ground and impact the ball. If you have little or no divot, you are a slider/ sweeper. You should look for a club with low bounce. If you take a regular sized divot, you are a driver/ slider. A medium sized bounce will work for you. If you take a large divot, then you are a digger/ driver. A high bounce wedge will work in this scenario. The correct bounce will help you hit more consistently. 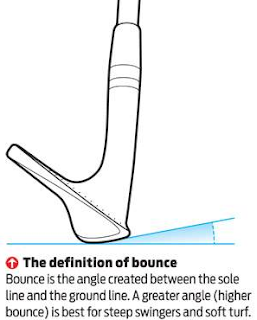 If you have a low bounce swing, but have a high bouce club, it may cause you to “top” the ball. With bounce course conditions also come into account. If you play in the Arizona desert (where the ground is generally firm) you would most probably need a low bounce wedge. However if you play in Pacific North West (where it rains a lot), the ground may be soft and soggy. In that case you should look at a higher bounce to compensate for it. 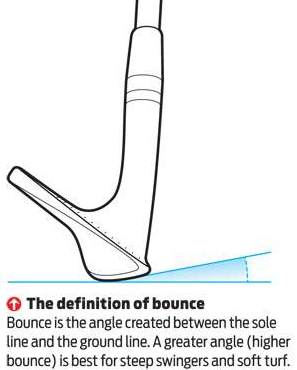 When selecting your wedges you may want to go for a combination of bounces. I am a slider/sweeper, but I like to have a sand iron with a high bounce to use from fluffy sand or long grass (rough). But a low bounce lob wedge for work around the green on short grass and firm ground conditions. There are traditionally three different finishes to wedges. Traditional chrome, black nickel and raw finish. Some golfers prefer the black nickel and raw finishes because there is no glare from the sun. The raw finishes (also known as oil can, rustique, rusty) have unfinished faces. These are designed to rust and have patina. The club faces are softer to play; which some people prefer the feel. It has been proven that raw wedges having more spin than others, is nothing more than a myth and just an old-wives tale. They all spin the same. Confused?? It is a very complex subject and wedges can be the toughest clubs in the bag to pick out. As with all clubs look for something which feels good to swing and easy on the eye at set-up.